Richard Giles asks: what really IS a Blue Moon?? Richard Giles, astrologer and feng shui consultant, has been busy researching the rare phenomenon known as the Blue Moon. He explains that a Blue Moon is when a Full Moon occurs twice in the same zodiacal sign in a single year, not just in the same calendar month, as is often put about in the media. If the two Full Moons are not in the same astrological sign, Richard argues that they are not truly "Blue". This is a fascinating story and one that will make interesting dinner conversation! The Full Moon occurs twice in Scorpio in 2008. The first, at 10:26 hrs UT on April 20, 2008 (UT is Greenwich Mean Time in the old money) happens at 0°43' of Scorpio and the second, or Blue Moon, occurs at 29°27' of Scorpio on May 20. Some of you may have been wondering which Moon is the Wesak Moon, as here we have two "Taurus Moons", which are Full Moons in Scorpio. Well, the first Full Moon in May is defined as the Wesak Moon, celebrating the birth, enlightenment and ascension of Gautama the Buddha, so to set our minds at rest, we can clearly say it's the May Moon, not the April one. The term 'Blue Moon' is used in the media at times and as well in popular literature. Perhaps where you may know it best is from the song of the same name about "standing alone, without a love in my heart," etc. What is a Blue Moon and where did the phrase come from? Well, it has a long and checkered career and it also has several meanings coming from different cultures. Lets see what we have from history. My interest was triggered by the popular media attention focusing on the 'Blue Moon' of August 2004. It received a lot of publicity in the papers and even science journals. As an astrologer I've had a look at the Blue Moon phenomena in the past and discovered a few things about the origins of the term. August 2004 had two Full Moons, one on the 1st and the second on the 30th August. These were referred to in the mainstream media as 'Blue Moons', which definition came from a children's "Facts and Records" book, published in 1985. (Margot McLoon-Basta & Alice Sigel, "Kids' World Almanac of Records and Facts," New York, World Almanac Publications, 1985). Where the authors of that book got it, no one seems to know. The term, using the occurrence of two Full Moons in a month is what's in use in today's media, but the origin of the phrase is much different from what we may believe. An older definition for the Blue Moon is recorded in an issue 150 years ago of The Farmer's Almanac from Maine, USA. According to this definition, the Blue Moon is the third full moon in a season that has four full moons. Why would one want to identify the third full moon in a season of four full moons? Some years have an extra full moon—thirteen instead of twelve. Since the identity of the moons was important in the ecclesiastical calendar (the Paschal Moon, for example, was crucial for determining the date of Easter), a year with a thirteenth moon upset the Christian calendar, since there were names for only twelve moons. By identifying the thirteenth moon as a Blue Moon, the church calendar was able to be consistent. The very idea of a "calendar month" is a relatively recent concept, as months were originally measured by the period between lunations, creating a Lunar Calendar of some 13 months per year (the word "month" comes from "moon"). A cultural revolution took place in the Classical Period, when the ancient rule of the lunar goddesses was replaced by the rule of the solar gods. This also saw the development of the solar year of 12 months, based on the seasons and connected with the 12 signs of the Zodiac. The true origins of the phrase 'Blue Moon' are really much, much older. In the ancient Lunar Calendars, time was measured according to moon cycles, change of seasons and the period between equinoxes and solstices. Our current Gregorian Calendar system dates from the time of Pope Gregory in the 16th century. The pre-Gregorian calendar was the Julian Calendar (the Roman Emperor, Julius Caesar, came up with the idea of standardising the chaotic Roman Calendar in 47 BC), a solar calendar of 365.25 days with various 28 to 31 day months and a leap year every 4 years. This is not out by much, but was out by enough to have put the calendar year out with the seasons by eleven days or so by the time of Pope Gregory, who rejigged the calendar in 1582 and put in the current leap year system. Many cultures, including the Protestant and the Orthodox communities were suspicious of such popery and did not adopt it until later (even now the Julian Calendar is still in use in parts of the Orthodox Church). However, it was in 1582 that the Gregorian calendar was adopted in Rome, Spain, Portugal, France, the Netherlands and Scandinavia. And it wasn't until 1752 that England adopted the new calendar. What is an interesting historical aside is that in 1752 Uranus was in Pisces and Pluto in Sagittarius the same as today. At that time Pluto was in a positive trine to Neptune in Leo allowing for fundamental change. Back in 1582 Pluto was in another Fire sign Aries and Uranus was in Aquarius. Uranus was in a very challenging inconjunct (150 degrees) to Neptune making it a suitable time for shifting the way we standardise time. With Pluto in Sagittarius back in 1752 we experienced the Pluto return in 1997/98 for the chart of the adoption of the Gregorian calendar by the English speaking world through Britain. Its not surprising that the role of the western calendar is being seriously questioned now and much is being made of the Mayan calendar and its more flexible role in measuring time and the use of moon calendars again in popular culture. Looking back through literature, the earliest western references to a Blue Moon are in a phrases as examples of obvious absurdities about which there could be no argument. Four hundred years ago, if someone said, "He would argue the moon was blue," the average sixteenth century man or woman would take it the way we understand, "He'd argue that black is white." This understanding of a Blue Moon being absurd eventually led to another meaning, that of "never." Something that would never happen in a 'Blue Moon'. Or similar to the phrase that it would be on the Twelfth of Never. In the 19th century, the phrase about a 'Blue Moon' developed, meaning "never." The phrase today, 'once in a blue moon' has come to mean "every now and then" or "rarely". The modern calendar, being an artificial construct from our Christian popes, does not really relate adequately to natural cycles, whereas the astrological position of the Moon is far more important in terms of moon cycles and in terms of the energy signature of each moon phase. What I believe are the real origins of this phrase come from Indian Vedic culture where the second of two Full Moons in one astrological sign was actually known as the 'Blue Moon'. If within the sign of Taurus, for example, a Full Moon occurred at the first degree the sign then later that zodiac sign period the Full Moon came in at the 29th degree of the sign, then this second Full Moon in the sign was considered a very holy and auspicious day. It's considered to be a special time, when the connections with heaven and with the gods is very potent. Its a powerful and spiritually significant time for prayer and meditation going back a thousand years. 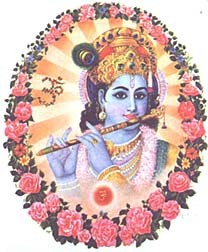 The colour blue and its importance was derived from the skin colour of Lord Krishna, who is revered as the divine flute player. The special energy of the second Moon was considered 'blue' or divine by Indian religious scholars and priests. Thus they celebrate two Full Moons in the one sign and had large religious and sacrificial ceremonies to acknowledge the importance of the second. Over recent times this happened in May/June 1997 when two Full Moons occurred in the Sagittarius/Gemini axis, in Feb/ March 2000 with two in the Virgo/Pisces axis and July/Aug. 2002 in Leo/Aquarius. You can see they occur every three to five years or so. Because the Indian astrological tradition is a little different from the western tradition and they use a sidereal system based on where the constellations actually sit in the heavens then you may find the dates will vary slightly. But they have the origins of Blue Moon celebrations in their culture going back a thousand years. And the fifth meaning – we know there are actual examples of the Moon turning a blue colour. When the Indonesian volcano Krakatoa exploded in 1883, its dust turned sunsets red & green and the Moon blue around the world for almost two years. In 1927 a monsoon in India set up conditions for a blue moon. And the Moon in Newfoundland was turned blue in 1951 when huge forest fires in Alberta pushed smoke particles high into the sky blanketing its light. There are probably at least six songs which use the term "blue moon" as a symbol of sadness and loneliness which is the opposite twist on the Vedic meaning. In a number of them the singer's Moon turns to gold when he gets his love at the end of the song. Wonderful! Click here to select Your Year Ahead. Plus my own research for Blue Moon stories in 1997. Richard Giles is an astrological, geomancy and Feng Shui consultant living on the Sunshine Coast, Queensland, Australia. He is available in Australia for consultations on your home and business. Richard has been involved in astrology for more than 22 years and writes for several Australian magazines. He is also the director of the Earth Healing School of Queensland, running practitioner courses in Earth Healing and Geomancy. You can phone him on (07) 5435.0158, or click to contact Richard Giles.